IGB Corp Bhd is replicating Mid Valley City here in Johor with the project's gross development value exceeding RM6 billion, its chief said. The megamall project in Johor Baru is the second such development for IGB and is also the first project for the developer in Johor. Group managing director Robert CM Tan said IGB is bullish on the Johor market, especially with continuous growth in Iskandar Malaysia and more Singaporeans going there for properties. Tan said "Mid Valley Johor" will take some five years to complete and construction is expected to begin by the end of this year or early 2013. There are many issues to be addressed such as land matters and finalising the project's development plan for approval. "We have not finalised the planning of the project. We will undertake a study to identify the best components. Right now, we plan to build a 1.5 million square feet mall, either one or two hotels, high-end residences and commercial towers. "We hope to resolve the land issues and other matters soon," he said yesterday after inking a memorandum of understanding with Selia Pantai Sdn Bhd to set up a 70:30 joint venture company named Southkey Megamall Sdn Bhd. Johor Mentri Besar Datuk Abdul Ghani Othman was present at the signing ceremony. Tan said IGB will maximise the value of the land, estimating the project's gross development cost to be in the region of RM3 billion. Southkey Megamall will buy 15 hectares for the project. The land is part of Selia Pantai's RM15 billion Southkey development, which started early last year. Selia Pantai is a public-private partnership between Selia Group founded by Datuk Mohamed Zaini Amran, and Johor state investment company, Kumpulan Prasarana Rakyat Johor. 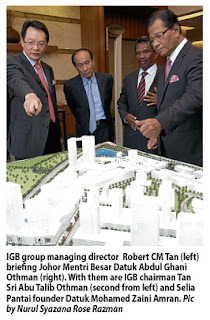 Tan said IGB is also mulling over developing a megamall project in the north, most likely Penang. "We are always looking for opportunities to expand. We are also looking for real estate developments overseas," he said. IGB shares closed at RM2.85 yesterday, seven sen lower than Tuesday.